Welcome to Round 2 of my “Favorite Things Holiday Giveaway” series! 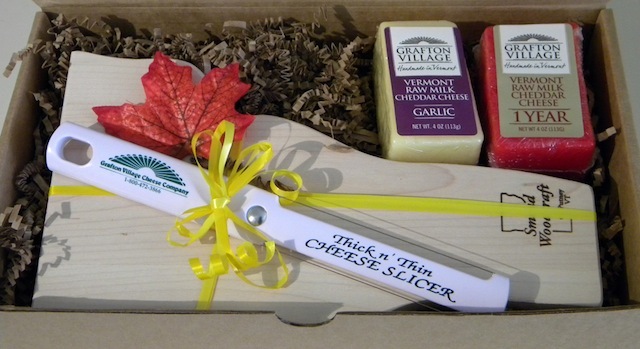 Today’s giveaway is for a Grafton Village Cheese Company gift package which includes Garlic Cheddar (my favorite! ), Aged Cheddar, a VT-shaped cutting board, and a wire cheese slicer. When I was at Grafton in October, choosing which cheese to buy was insanely difficult due to the overwhelming selection of cheese carried in the shop but I think you’ll be very happy with what is included here…and I’m jealous about the cheese slicer since I regretfully didn’t pick one up for myself when I was there. Anyway…this package will ship directly from GVCC who specializes in shipping cheese safely. GOOD LUCK!! Answer this question in the comment section of this post (and only this post): What is your favorite type of cheese? Only one entry per person will be accepted and you MUST include a valid email address with your comment. You have until Friday December 2, 2011 at 11:59pm Eastern to enter this giveaway. The winner will notified by Monday December 5, 2011. If you do not respond to my email within 48 hours, another winner will be chosen (also at random). Disclosure: This giveaway is sponsored by yours truly. smoked cheddar, goes great with popcorn, and wine. I know it’s nothing gourmet, but I really love parmasan – in any form, by itself or with other stuff. It’s just good. . . . .
Smoked swiss cheese makes an amazing grilled cheese with tomato soup lunch! I use Feta the most, but I love all kinds of cheese. Processed Cheddar, Vintage Cheddar; I love them all. I love a nice sharp Cheddar! I love cheese period! My favorite though (right now) is the laughing cow garlic anf herb cheese. I have it almost everyday with an apple for a mid-morning snack. I love pretty much all cheese! I guess my favorite would be cheddar. I’m partial to goat cheese! Its so hard to choose just one, but if I had to I guess a good sharp cheddar would be my choice. I had some cheese called butter cheese from an amish market in PA. It was so delicious. It practically melted on your tongue. Smoked gouda!! A pizza place near me uses it on a diablo pizza. to. die. for. I have two. First is Prima Dona..it’s an aged cheese from our local cheese lady. The second is from Washington State University…Crimson Gold. It is so awesome. They have their own creamery ! I love smoked gouda! Who doesn’t love cheese that taste like bacon! Sharp cheddar with apple slices! I love Brie and a Sharp Irish Cheddar. Goat cheese is my favorite kind of cheese. Love it on salads or just plain! I love smoked mozzarella…goes great on paninis and in pasta salads! It’s so hard to choose a favorite since I love most cheeses. I guess I’d have to go with brie because it’s that special treat cheese that makes me happy. I would have to go with brie, because I like baking it then scooping the oowey gooey mess up with a cracker. yum! Thanks for the chance to win! ohh I’m a big horseradish cheddar girl, such good flavor. Cheese is the best! Who doesn’t love cheese, great giveaway! I love aged cheddar. Yum! Cheddar, Cheddar, Cheddar, but I would never turn down a slice of any kind of cheese ! i love sharp cheddar for eating. or asiago for breads. i can’t decide!! I’m a sucker for any cheese but my favorite is goat cheese. My favorite cheese is goat Gouda. I’m a big cheddar cheese person. Recently, I had a white cheddar with cranberries in it. It was delicious. I love a smooth goat cheese on top of a nutty , cranberry salad. Cooper cheese ! Love to eat it right from the package ! I love feta and parmesan. Lovely giveaway! After living in Switzerland my favorite cheese is Gruyere hands down! My favorite cheese is brie. But I really have hardly met a cheese I didn’t love. One cheese? That’s difficult! I love them all, but my favorite is mozarella! I love pretty much all cheeses, but my favorite is gruyere. Yes, choosing only ONE cheese is tough…..but I’ll get on the smoked Gouda bandwagon! Just make sure the supply of perfectly chilled white grapes is abundant, too! Chimay cheese! Soft cow’s milk that is perfect with some crackers! My favorite cheese is Petit Basque, a French sheep’s milk cheese. It’s so tasty! I love pretty much all cheese! I eat cheddar most often so I guess that’s the one I’ll have to choose. I love very sharp cheddar! Parmesan is always my favorite, we picked some up from Parma, Italy about 2 months ago and I’m going to be so sad to see it go! pepper jack, love the zing! I love any cheese. I cook with a lot of cheese too. I guess my favorite would be any type of cheddar. I love all cheeses! I love brie! But lately, I’m loving gouda and havarti! I love Extra Sharp Cheese! My favorite cheese is sharp cheddar..the sharper the better for sure! I love medium Cheddar. Yum!!! A habanero cheddar (not sure who makes it); it is sooo good! I really like Vermont white cheddar! Pepperjack! Best way to add a kick and cheesy goodness at the same time. I really like provolone cheese. But I may have a new favorite, my husband made me try goat cheese the other day and surprisingly it was really good. My favorite cheese is probably Parmesan although I won’t turn away any cheese! Love it!!! Great giveaway, thanks!!! I love cheddar – in eggs, on a cheese plate, on pizza…anywhere! My favorite type of cheese is warm, melted gooey BRIE! I had some on Thanksgiving, and I’m still thinking about it. I love havarti, especially with jalepenos mixed in! Yum! After our trip to France last year, I’ve become a huge fan of chevre. It’s delicious in just about any dish! I love any type of goat cheese! I looooove Grafton Village’s Garlic Cheddar! so hard to choose! extra sharp cheddar is at the top of my list. thanks for the giveaway. I love sharp cheddars- the sharper the better! Give me big spoonful of ricotta any day of the week (my Italian grandmother would shame me for saying anything else!) Yummy! Wow, what a great giveaway! My favorite type of cheese is smoked Gouda….YUM! I can’t eat cheeses with rinds (brie, camembert, etc. ), which is a great sorrow to me, but I do love me some cheddar. Yummy nummers. I like mozerella, munster, and feta the best! I LOVE LOVE LOVE all cheese but I am a huge fan of extra extra sharp cheese. I love blue cheese too though. My fave overall would have to be munster cheese or harvarti with dill. Ooo, I’m a sucker for brie…but just about any cheese (except Swiss) will do! I have to go with the classic choice – cheddar! All kinds, but my very favorite has to be sharp cheddar. So hard to pick just one, but I love goat cheese. It *is* hard to pick one, but I just adore bleu cheese – that with some dried cranberries in salad, yum! Pepper jack or freshly made mozzarella! It’s hard to pick just one, but I have to go with smoked Gouda. My mother introduced me to Vermont white cheddar cheese several years ago. Just having some on a wheat cracker puts my tastebuds in heaven. I have to say that I do love a good ripe Brie. I also love aged Gouda and of course Cowboy Creamery’s Humboldt Fog is delish. I think my husband is half mouse half Cookie Monster so he would be in heaven to win some quality cheese. I could no sooner choose a favorite star in the heavens. Being from Wisconsin, I eat my weight in cheese every month (I wish I were kidding). Super sharp cheddar has a special place in my heart, along with any sort of spicy, peppery cheese, or something with garlic. Yummm. Another Wisconsin girl here… So many amazing cheeses calling to me every day. Bleu will always win as the favorite, but there isn’t a one I would ever turn down. Well that’s easy…cream cheese! But my second runner up is Garlic Cheddar…YUM! My favourite is feta! I had it for the first time in a salad at Thanksgiving dinner. Can I have it on everything?! My favorite cheese is Fontina. Gouda…i’m a sucker for it, even when it is on a plate with some crackers and salami! Gruyere! But I love’em ALL! Great giveaway! I love cheese with cranberries in it!! And I love smoked gouda, and parmesan cheese. Basically all cheese! Sharp cheddar! I could eat it at any time and I always try to have it on hand! Sharp cheddar is my favorite! I am a fan of cheese curd – yummy, salty, squeaky cheddar cheese curd from Tillamook is a favorite when I visit my brother in Portland, OR. My favorite for snacking – a spicy pepperjack or brie with honey and candied nuts. My favorite for cooking, a good sharp cheddar or parmesan. Basically I just love cheese! I absolutely love Manchego cheese. I got hooked on it when I lived in Spain! I really adore cheddar. Mild, sharp, extra sharp, smoked, you name it and I probably love it! My favorite type of cheese is a good fresh farmers cheese. I love how fresh farmers cheese melts in a fondue. Goat cheese is my favorite cheese! And Gruyere! I love brie or muenster! I absolutely adore warm brie. All melty…on crackers, with fruit, by itself….yum. I’m very fond of plain old cheddar cheese – especially from Vermont! Vermont white cheddar. I grew up in VT (but no longer live there), and will always love, love, love their cheese! I love all types of cheese. But my favorite would be rosemary goat cheese. 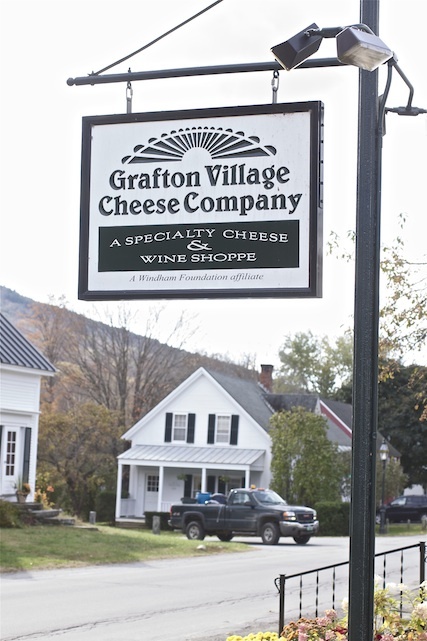 I visit Vermont at least a couple of times a year, I really need to add this cheese shop to my trip! My favorite cheese is classic Vermont sharp cheddar! gouda, gouda, gouda, but of course! I love goat cheese. I mean I love a lot of different cheeses but this past year I’ve tried so many wonderful goat cheeses I’m sort of in love with it now. I love pretty much all cheese, but I’d have to go with smoked gouda. Yum! I love goat cheese, lightly breaded & baked for salad, mixed with olive oil & spices to spread on a french baguette, rolled in blueberries or cranberries to spread on crackers. Oh, and in a cheese ball. Love It! First, thanks for the opportunity! If I had to pick only one it would have to be extra sharp cheddar! I couldn’t live without my mom’s baked Mac and cheese recipe!!!! As I always say “all I need is cheese, wine and bread!” My cheese of choice would be Dubliner. My Star and I love this cheese! Horseradish cheese (not sure if it is cheddar based)! I am a pretty plain gal and I really love a good, aged cheddar. I have an allergy to cow’s milk and I miss cow’s milk cheese the most. My favorites included cheddar, provolone, mozzarella, swiss, and brie. Fortunately, I can purchase MANCHEGO at my local grocer. Manchego is made with sheep’s milk. I wish I could choose a cheese I like best. They are all my favorites!!!!! I love all cheese. I haven’t met a cheese yet that I don’t like, but the one I always choose first on a cheese platter is pepper jack. Manchego!! But I love all cheese. Mmmm…Brie…but it’s so hard to choose. As a Wisconsin girl, I get to sample lots of tasty cheeses! My Favorite cheese…this may sound boring but good ole’ Cheddar Cheese. I love all cheese, but my favorite is a good aged sharp cheddar. My favorite cheese is hot pepper! This is 100% me showing my inherent lameness but my favorite kind of cheese is an Cooper Sharp White American Cheese. It’s really great in scrambled eggs and it’s going to make the lunch I packed today awesome (a sun tried tomato wrap with buffalo chicken, baby spinach and the above named cooper sharp cheese). It is so hard to pick just one! However, I really don’t know if I could live without good old mozzarella. The first time I made it was an experience! I LOVE a good smoked Swiss Cheese. It makes a good grilled cheese sandwich! Of course, you can’t miss the tomato soup to go along with it, either. It’s a tie between very sharp cheddar and bleu. I like all cheese, but use mild cheddar the most. My whole family is big on cheese, and when my youngest daughter comes home from New York, she always takes cheese back, and her fellow co-workers, just love that. Cheddar is my favorite. LOVE IT. With warm crusty bread and a pitcher of sweet tea and I’m set. My favorite type of cheese is sharp cheddar. YUM! Havarti is my favorite — creamy, nutty goodness! I love a good Cheddar! I love any bleu, but Roquefort is my favorite! Since I was a kid, my favorite’s always been Muenster cheese! My favorite cheese is GOAT. Oh, I might be in LOVE with goat cheese. lately it has been goat cheese. thanks! Tough choice, but I think my all time favorite is gruyere! I cannot get enough Gouda! Stinky cheeses are my favorites, like bleu or stilton. I have been on a serious goat cheese kick! Although, picking an actually favorite pains my heart. Favorite cheese is definitely pecorino romano! We put it on everything you would normally put parmiggiano on! Blue cheese…the stinkier the better! I’m fond of most cheese, but I LOVE sharp cheddar and blue cheese. I must say I love a warm brie. So mouth watering!! But really, I’m not picky. I love all cheeses!! I love love love blue cheese. Sooo delicious! I’ve been a sucker for Havarti since I was a baby – especially with dill. What can I say, I was a kid with great taste in tasty cheese! If I have to pick one white cheddar! This is a tough one…I really like a triple creme brie but a good cheddar is also delicious. My favorite is sharp cheddar! I love ALL cheeses!! Especially sharp and stinky ones!! Hahaha! I probably eat sharp cheddar and gorgonzola most often though. Yum!! My favorite cheese is the Grafton Duet–blue cheese on top and sharp cheddar on the bottom. YUM. The best cheese that I have ever had the pleasure of tasting is Grafton’s Duet. I consider it “cheese pie”. The crusts….2 amazing slices of grafton cheddar.. The filling…Blue cheese. Whoever came up with the idea to meld my two favorite kind of cheeses…kudos! Best cheese in the world! The combo is amazing! Our favorite type of cheese is cheddar. We always have some in the fridge. We first discovered Grafton cheddar while listening to a show on NPR. They were talking about how this cheddar had won the title of best cheddar. I went to their website and ordered some for my husband for Christmas. We enjoyed it so much that we made a roadtrip to Grafton to visit the factory and stock up. It is now a yearly pilgrimage we make, buying enough for us as well as gifts for others that we have “hooked” on their cheddar. Even though we have found that some of our local stores carry Grafton cheddar, we wouldn’t think of not making the trip each year! Vermont is such a beautiful place to visit! I love cheese, but I can’t eat it since I am lactose intolerant due to chemo. However, my husband (and my dog) love cheese, so I put it in lots of stuff for them when I cook/bake. Sharp cheddar. Sorry. I am boring. Blue Cheese, cheddar, parmesan, they are all my favorite! Nothing beats a smoked cheddar! My favorite smoked cheddar is a Vermont cheddar smoked at the Green Mountain Smokehouse. I love love love goat cheese. Any recipe with goat cheese is pretty much a guaranteed winner for me. My current favorite is Grafton Duet! Cheddar cheese on triscuits! Umm the best!! You’ve just asked a seriously debatable question. Going to have to go with creamy blue (bleu?) … it’s so stinkin’ divine. Oh my, so many choices! Probably either a really, really sharp white cheddar, or blue cheese. Nom nom nom! I love extra sharp white cheddar. Oooh! It’s a toss-up between Feta, Gouda, and fresh Mozzarella! Classic Vermont Cheddar. Especially if it’s from Grafton Cheese! Cheddar – I could eat it all day! Blue Cheese! My husband made me a blue-cheese burger this afternoon and it was soo good! Cheese is probably my favorite craving in the world so picking a favorite is tough. Ummh, let’s say it is Brie or is it goat or is it gouda? Brie it is!! I love aged white cheddar. I eat it by itself and I also put it in an artisan bread recipe that I like to make. I had some tonight. I gotta go with a nice cheddar! Very versatile. Great giveaway, Tara! Thanks! I love a nice aged cheddar! Love colby cheese! Not colby jack…just colby!!!! I’m a sucker for cheddar, but really I like any of the sharper cheeses. My favorite cheese is hard to identify since I love so many kinds. I guess today I will say smoked provolone. I used to work in the cheese department of a food retailer and, while I love most cheese, Pyrenees Brebis is my favorite. It’s a french, semi-soft cheese from the Pyrenees region of France. It’s creamy and perfect. It’s hard to choose a favorite cheese, but if I had to I’d go with cheddar. Yum! There is nothing beddar than Cheddar. My favorite kind of cheese is feta! I could put it on every salad ever. I’ve tried Brie for the first time recently and it has become my favorite cheese! my fave cheese is blueberry stilton ! My favorite types of cheese (since I could not pick just one!) are brie, Sharp White Cheddar and smoked Gouda!!!! Yum! Oh my…cheese coming directly to my house? Yes please! My favorite is Humboldt Fog, a California blue, which my (now) husband and I first had on the day we got engaged! I have been a Cheddar Cheese fan all my life and I know in the recent trips to Vermont, there is REALLY good cheese made there! I am fond of Grafton DUET though, since it combinds the sharpness of the cheddar with the twang of the blue! Happy Holidays!!! It is very hard to pick just one, but I suppose I would hate to live in a world without a good, sharp Cheddar. My favorite is Parmesan!! It’s good with everything, especially pasta and bread! Cheddar is my favorite cheese of all time! I love love love brie!